It might be the weather, and the way we turn into ourselves when it gets cold. Our muscles work harder to stay warm and our brain naturally goes to warm and cozy places in our memory. Or it could be my birth week in November that causes me to reflect on the experiences that formed me and my idea of ideal. I naturally get tired around this part of the year, I want to retreat to my piles of notebooks and earmarked book pages to build the better me. This is my New Year. Although I am ill prepared for the aging part of my life, I can generally say that I am okay with myself. Not in a gloating way, just in a way that says that if I never do anything more than I do now, I think I would be proud. But, those earmarked books and those tea stained idea accounts are in the old desk, and if all goes to plan, next year will be amazing. Thankful started back at school this month. It's been a hard adjustment for Prudence, she is always close at heel with her older sister. Shamefully, I have to admit, it's been a little easier for me to get things done. Not by much, but enough to notice. Its not quite Autumn yet, but its cool, and the horse Chestnut tree in the back is dropping mountains of brown leaves. The leaves hide the miniature balls of fury and hate, the horse chestnuts themselves. Inevitably, I will hear one of the hens hoot and holler, and I will charge out in my bare or stocking feet, forgetting my back yards' natural booby trap. I feel a looming sense of unfounded fear about winter coming on, there is a need to run around and grab snippets of green, take pictures of the melons still left in the garden, gather more and more firewood and hoard food. Is it because of my heritage career? My homestead line of thought? Is it an inherited knowledge from grandmothers past? Whatever it is, it has become my enemy, I cannot enjoy the change in seasons as much as others do because of it. September so far has been productive and kind to us. We have been able to sell our soaps at a few outdoor markets again; I love connecting and talking with the customers that have supported my journey so far. I love how my soaps look in the sun. We were able to acquire an old cast iron stove, heavy and enameled black, for our kitchen. Thankful has settled in and feels comfortable with her new classmates, Prudence has decided to eat more and use words like 'treat', 'please' and 'toot.' Our work calendars are filling up (a good and bad thing), and because of this, our cupboards wont be bare because we chose to live out our heartsong. This is Margaret Meister Fitzgerald. She was my great grandmother, on my mother's side. 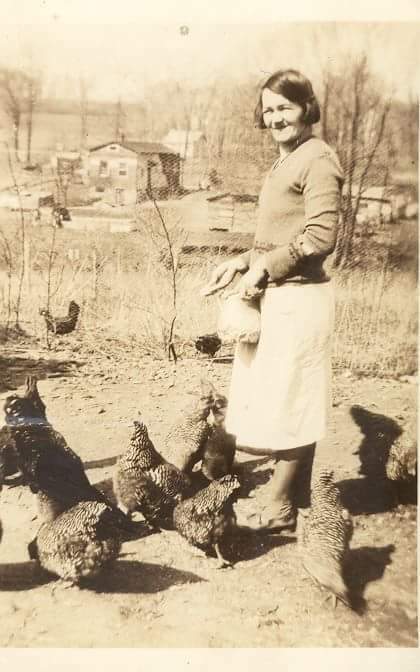 Taken in the 1930's, she was on the family property, next to the chicken house. In the background is present day Rosyln, Pa, just beyond the Sandy Run Creek.